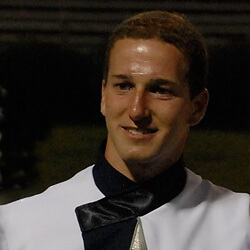 Mark Donahue, 20 Illinois State University Blue Stars Baritone, Drum Major 2008-2010 How did you choose your corps? I chose the Blue Stars because I knew a friend of a friend who had marched there. I was a fan of the corps' shows and the direction they were taking. What was the experience like the first time you auditioned for a corps? My first audition camp was intimidating. I had never done anything like it, and I went in with the mindset that I didn't have much of a chance. I left thinking I would never have a spot, but I later got an e-mail that they offered me a contract. What's the best way to prepare for an audition? The best way to prepare is to remember that you're not just preparing an etude or exercise, you're preparing for an experience. Most corps are trying to put you in the shoes of a member for a weekend. If your focus is only on the 10-minute audition, you'll miss out on a lot of the experience and fun. Beyond that, don't be afraid to ask questions. Seek out former members, parents, staff, etc., and see what they have to say. What would you say to someone who is unsure whether or not to audition for a drum corps? If you are unsure whether to audition, just do it. It's very difficult to get an idea of what it's like to be in a drum corps without actually doing it, and corps are offering you that chance during their audition weekends. Any other advice? Don't forget to enjoy the audition weekend. I remember the last day of my first camp I was overwhelmed with the weekend and was sure I wouldn't have a spot. Then we started playing some show excerpts and I heard the high brass come in. I remember thinking, "Oh right, this is what drum corps is about. This is why I want to do this." Chances are you will be stressed or nervous, but something about drum corps brought you to the camp. Don't lose sight of that. In the Blue Stars, when times get tough you'll often hear members and staff say, "Remember the love that brought you here." It's a good reminder of why we chose to be in this activity. Learn more about corps audition dates, locations and additional info.